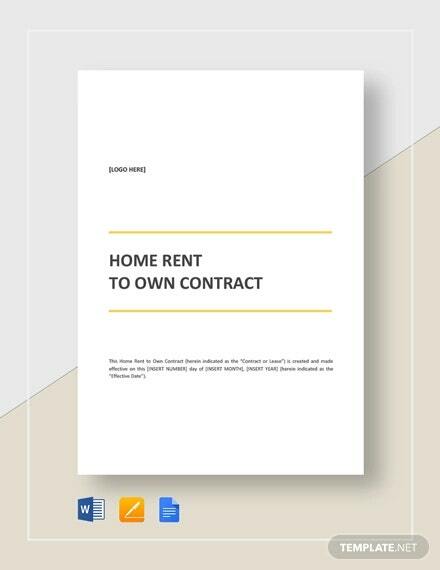 If you are a landlord or homeowner, or someone looking to become one, you can use these free samples of rent to own contracts as guidelines or templates in drafting such a contract. 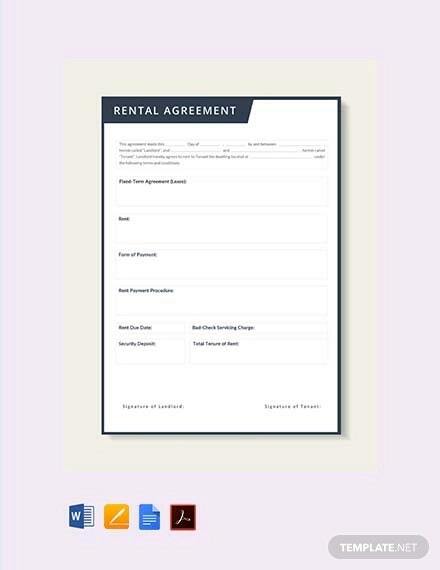 rent to purchase or lease to purchase. These deals are relatively rare, compared to straight-lease or straight-purchase options. 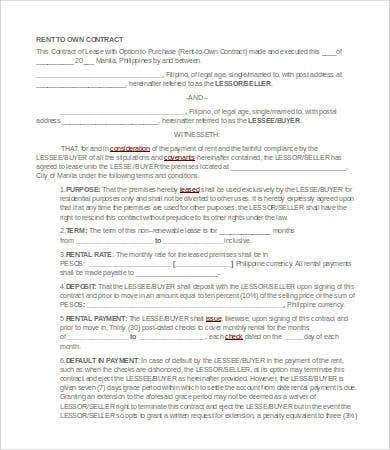 If you go for the lease to purchase option, you will have to pay the owner a one-time premium fee called the “option money.” This fee will reserve the property for your option. The owner will not be legally allowed to offer a purchase option on that property to anyone else while you are leasing it. 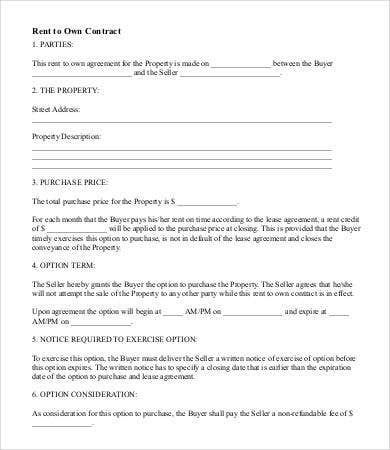 At the end of the lease, you have the option to purchase the property or opt out. 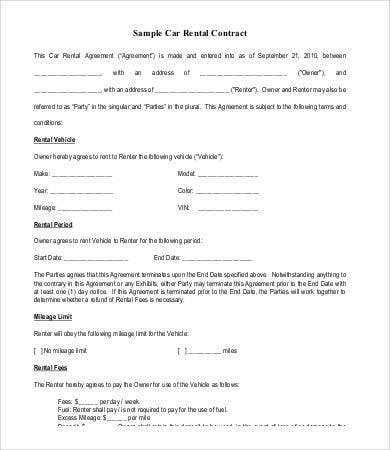 Note: You can only opt out of buying if the contract explicitly states it as an option; i.e., make sure it uses the word option. 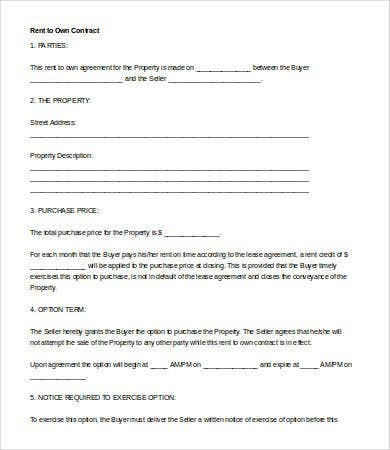 If it is a “lease-purchase” contract, you will be legally obligated to buy the property at the end. 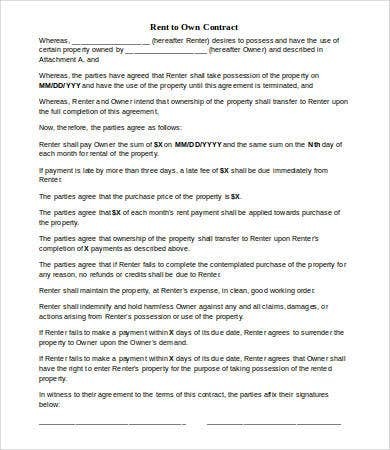 Make sure you get an attorney to look over the contract details before signing. 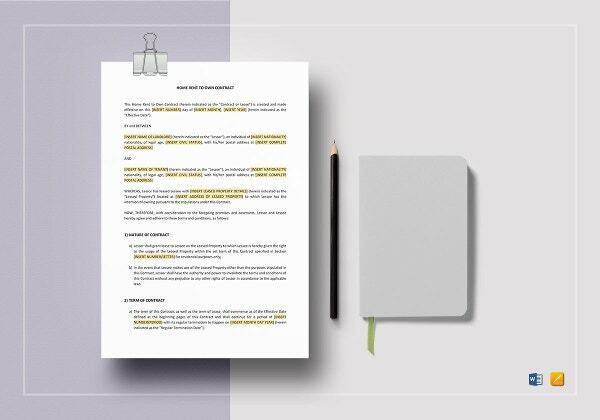 Real estate contracts are full of legal details and not everyone has the know-how and resources to tackle them adequately. Not to mention there is a lot of fine print. 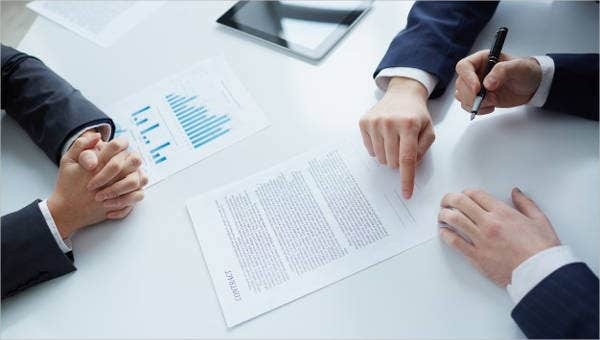 This holds true in real estate just as much as in any other contract, such as a Consulting Contract Template or Loan Contract Template. 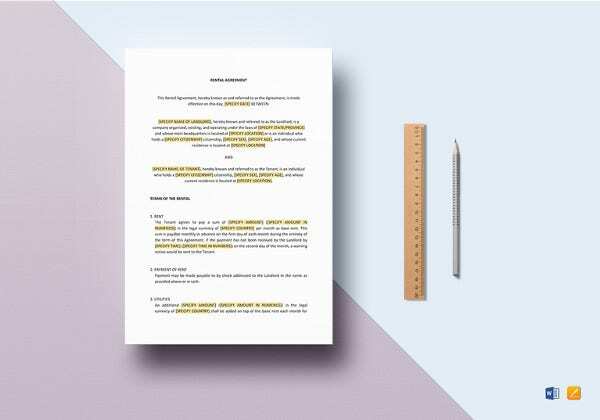 Use these contracts as templates to make sure you get all the important details covered. 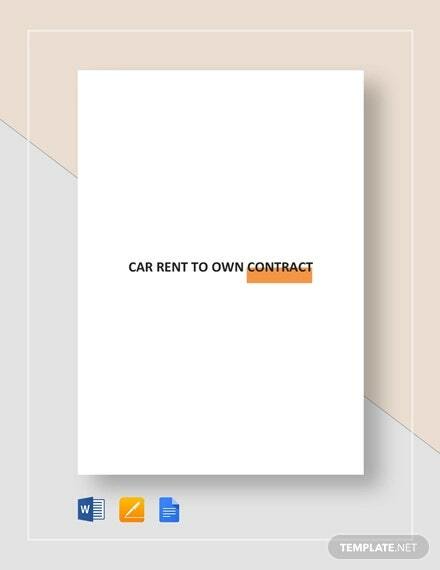 Included in the examples are rent-to-own contracts for residential properties as well as motor vehicles. Who Should Go for the Rent-to-Own Deal? the house has been on the market for a while and you can’t get any bites for the straight purchase deal. 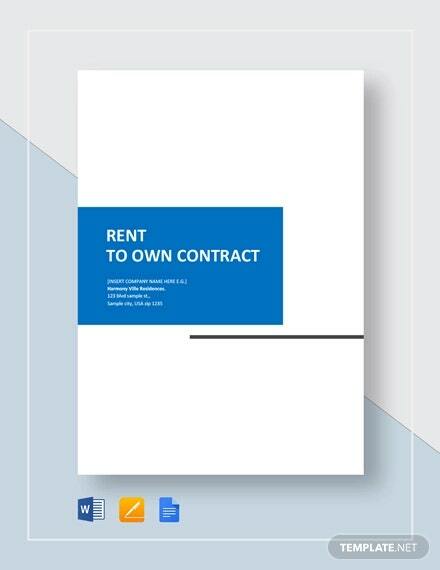 A rent-to-own will lower the bar and generate cash flow through lease payments. And there is always the chance it will end in a buy. you are looking to own a home but have a spotty credit record. The lease-to-own option will be an easier way into the buyer’s market. Note for sellers: No tenant is going to consider buying if the unit is falling apart. Look into drafting a good Renovation Contract Template and get the place spruced up before the first leasers come knocking.